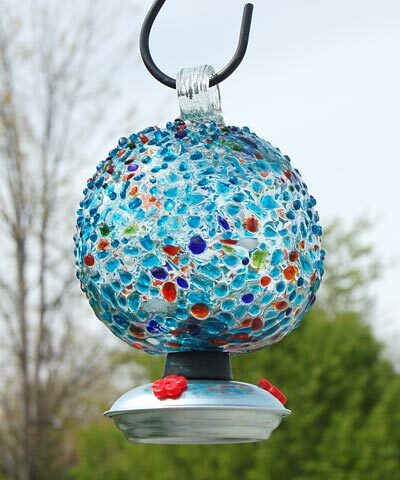 Add vivid color and ornamentation to your bird garden with the Parasol Dew Drop Multicolor Sprinkles Hummingbird Feeder. The spherical body and textured exterior of this piece form a remarkable item, and one of the most popular large hummingbird feeders available today. A clear glass orb creates a generous reservoir, holding up to 22 ounces of nectar for your hummingbirds. Pieces of colored art glass interspersed throughout the sphere lend dimension and interest to it, and many are raised for texture and style. The bevy of hues on the piece blends with any yard, and the recycled glass construction makes it better for the environment. A rubber stopper at the base of the reservoir attaches to a metal gondola, and three feeding ports surrounded by red plastic flowers offer birds a place to dine. Hang this item with its included, 7" "S" hook from the blown glass loop at its top, and remove the metal base to clean and refill it. Dazzle visitors to your bird garden with this Dew Drop Multicolor Sprinkles Hummingbird Feeder.